Thanks to talk about us. 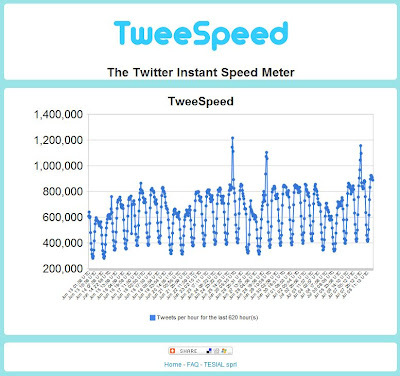 TweeSpeed is now hosted on the Java Google app engine which is currently in "beta" and I use the free version. Which means that CPU time is limited. If you ask too many figures, you may not receive the results caused by this limitation. What an awesome story and thanks for sharing! wow.. that is very nice tool... 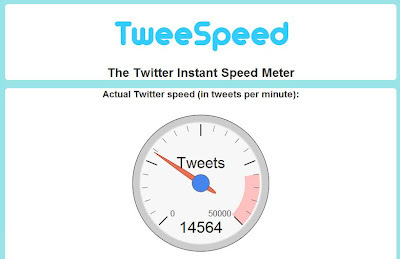 I will try this and give some review in my blog later..
do you know the total number of people who use twitter? i hear different numbers from many different people. Now this is a very cool little mashup! I am doing articles on twitter. Any ideas ? Twitter is one way of disseminating data and information in an instant. One tweet could reach millions of people allover the world. There are so many different twitter related pieces of kit out there these days. I personally use http://adf.ly/1Halv. It's a link shortening service that pays you for every click on your link. Awesome if you have a lot of followers. good every day twitter applications are more improved. This makes the platform much better than it is. Wow! Something different and awesome! Interesting. I might try that stuff.